Happy Saturday! It’s time for another Drunken Stampers challenge! This week, we’d like you to make a one layer card! These are always challenges for me! If you saw my earlier post this week, I made a one layer card for a Kraftin’ Kimmie challenge. I think that one was harder to do than the one I’m about to show you! Supplies: image stamp (Taylored Expressions – Animals in Love – Dachshunds), sentiment stamp (AMuse), Copic markers (Dog #1: N2, N4, N6; sweater: R24, R29; Dog #2: E55, E57, E59; sweater: RV21, RV23, RV00; hearts: R22, R24, R20, R21, RV32, RV34, R81, R83; shadows: W0, W1, other: 0), card base. Normally, I pick the colors of my images based on what patterned paper I’m going to use, but with a one-layer card, I was free to pick whatever colors I wanted! I hope you’ll have time to join us for this week’s challenge! Be sure to visit the rest of the Drunken Stampers team to see what they’ve created: Chaitali, Donna, Elizabeth, Nat, Spike, and Steph! Even if you’re a sober stamper (like me and most of the team), we’d love for you to join us for our challenges so you can have fun creating with us! Thanks so much for stopping by! All of the details on this challenge can be found at the Drunken Stampers blog! See you there! Kraftin’ Kimmie: One Layer Card?!?!?! 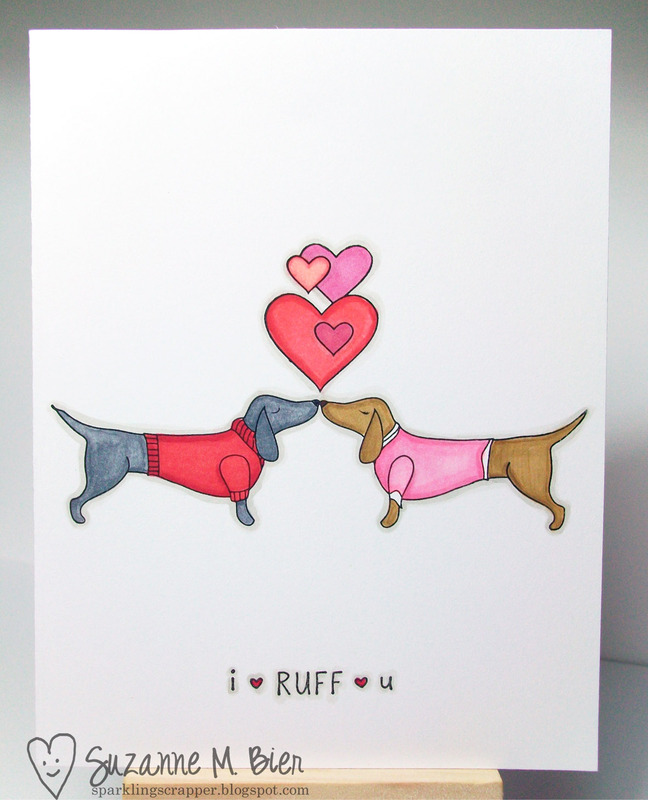 I love the Dachshund images!! A friend of mine has two, they are the sweetest dogs!! Great job on the one layer challenge!